Bringing in the New Year in Kremenchuk and Komsomolsk was a blast. Although time in Ukraine seems to fly by, days seem to last a lifetime. 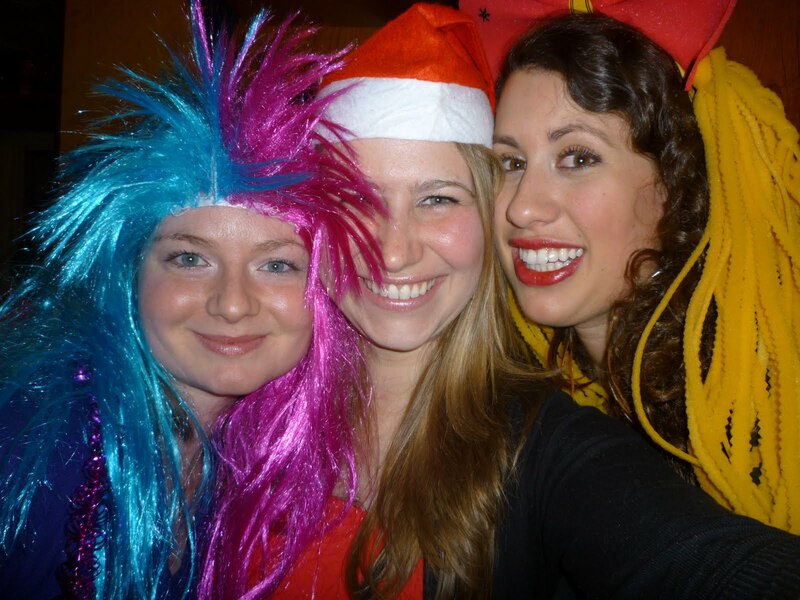 When Sarah, Lauren and I were finally reunited, it seemed as though we had never been apart. I am so happy to have such great friends only a five hour train ride away. My new friend, the pomegranate guy! 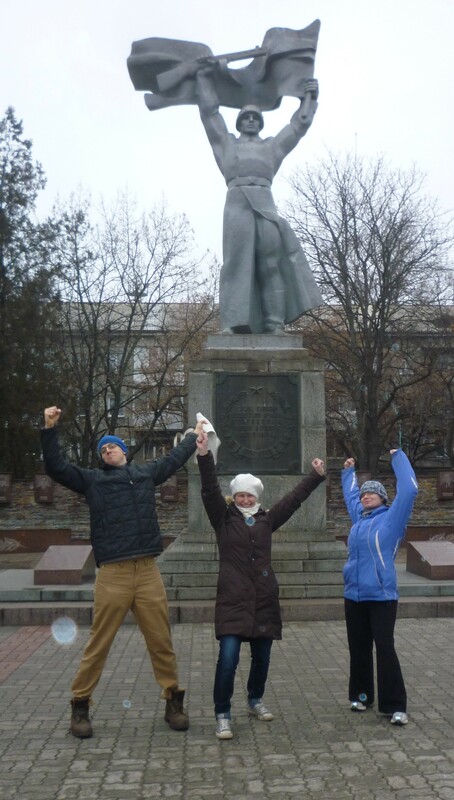 Lauren and her site mate, Nathan, picked me up at Kremenchuk’s train station late Friday night. Since it was too late to go out, we spent the evening chatting, drinking homemade wine, and learning about Nathan’s experience as a volunteer. I slept at Lauren’s host family’s apartment in the suburbs of the city. Saturday morning, after a much missed home made Ukrainian breakfast, we were joined by Sarah and walked around the city. Kremenchuk is beautiful and has its own beach along the Dnieper River. However, its architecture maintains the stereotypical post-WWII vibe, since almost the entire city was burned to the ground during Nazi occupation in the early 1940s. 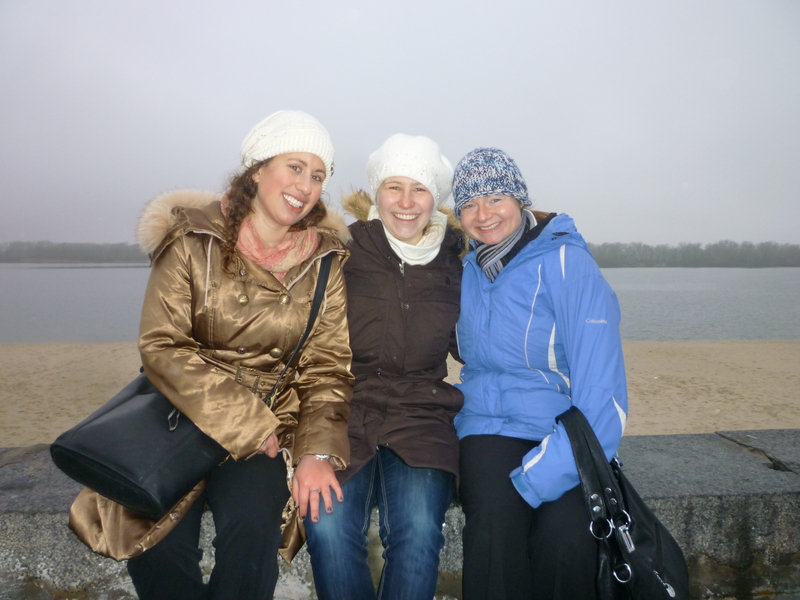 Saturday evening, New Years Eve, the three of us took a 20 min marshrutka ride to Sarah’s town of Komsomolsk to attend one of her co-worker’s parties. We arrived at 10:30pm and were immediately given wigs, hats, and glasses full of wine. We sat at the table alternating boy, girl, boy, girl and at midnight lit fire crackers (at the table) and started the feast. The next five hours were full of eating, drinking, games and singing. A good time was had by all. The night seemed to go by in 20 min. The next day we relaxed at Sarah’s apartment and walked around her town. Komsomolskyi also has a beach right on the Dnieper River is a popular place to live for people who work in Kremenchuk. We headed back to the bus stop around 8 pm but since nobody in Ukraine seems to think bus schedules are useful, we waited for nearly two hours and froze our toes off until it came. My train home left Kremenchuk at midnight and arrived in Romny around 5:30am. The ride was much more enjoyable than I expected. I had a bed all to myself, everybody was quiet and we were even served tea and chocolate. My only confusion was when to get off the train. It was dark outside so I couldn’t see any station signs and the conductor never announced any stops. My ticket said we would stop in Romny at 5:34am, but I assumed the tain could easily be early or late so I couldn’t rely on that time. I decided to wake up 30 minutes early and go make friends with the conductor. Fortunately, she took pity on me because I didn’t speak any Ukrainian and was traveling alone and told me she would come get me when we arrived in Romny. She did, and all worked out great. This past Tuesday, Wednesday and Thursday I spent at school with the other teachers. Although it is winter break for the kids, the teachers still have to show up and work. 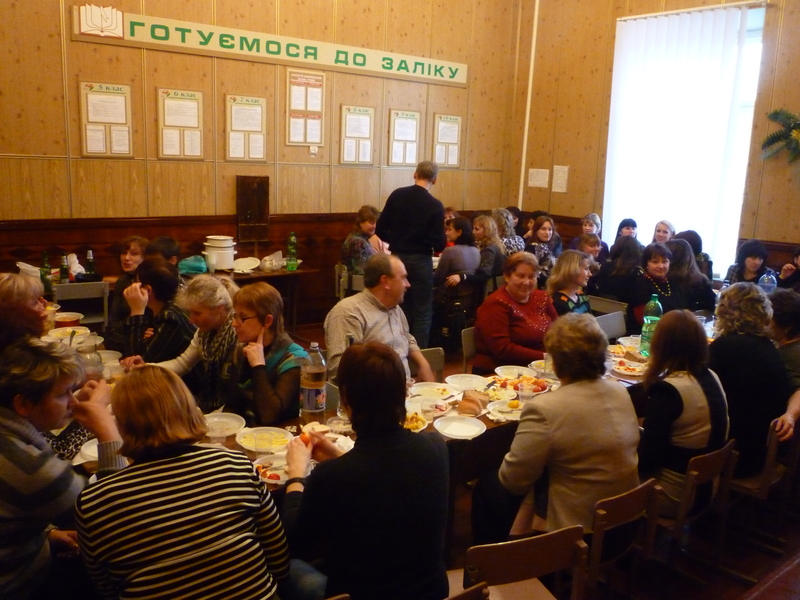 On Thursday, the teachers decided to throw a spontaneous party and prepared a feast complete with home-canned eggplant, tomatoes, fish, sausage, alcohol and of course potatoes. Never before have a seen 50 female teachers take multiple vodka shots together with such enjoyment. Knowing I couldn’t keep up with their tolerance, I drank wine which lead to my director asking the English teachers to teach me how to drink vodka…oh man. The teachers eventually convinced to give the traditional fourth toast to men 🙂 So I rambled out a slightly tipsy, Russian/English, jumble about how women need men and how much we appreciate the few but wonderful five who work at our school. 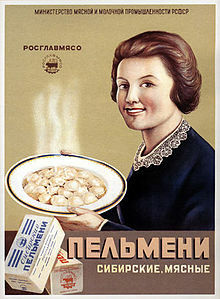 Old Soviet poster advertising Pelmeni - Siberian Meat. 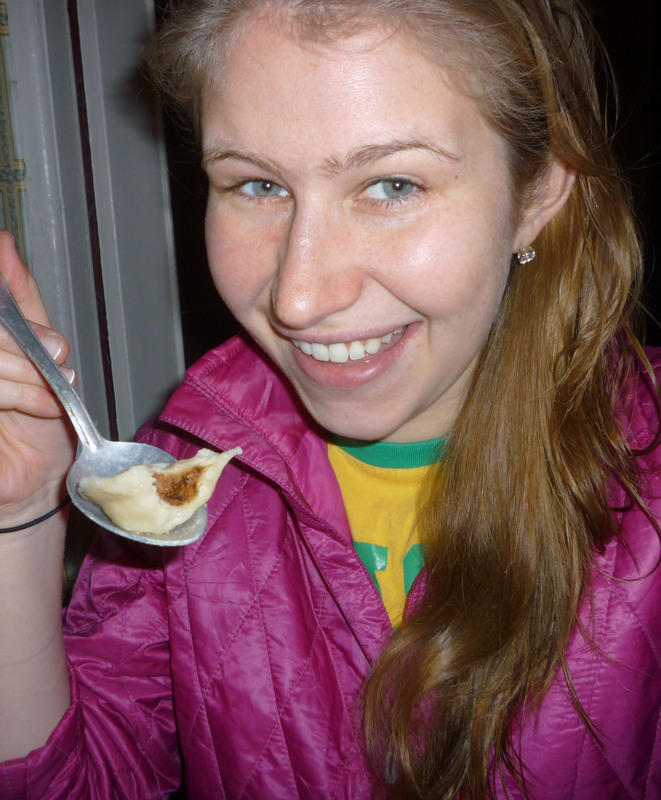 That night I decided to enertain myself by making Pelmeni, or homemade dumplings. Instead, I experienced my first citywide water outage. I am not sure of the technicalities, but a water outage affects the whole city and is considered a common occurrence. During an outage, there is still water in our pipes, but it comes out all nasty and red like mud. When I moved into my apartment, I was told to keep a basin full of water at all times in case I need water during an outage. This happened a lot at my school in Kyinka, so I wasn’t too surprised but it did ruin my Pelmeni plans since I needed a bucket of water and I had not put any aside. Mix 3 cups Flour, 1 cup cold water, 1 egg. knead dough until one mass then let sit for half and hour. Sprinkle flour on large table and hands to prevent dough from sticking. Fry some ground up meat, onion and spices. I used meat seasoning and garlic salt. Use a rolling pin to roll out the dough until it is flat thin, then cut out circles. I used the top of a shot glass to cut out mine. Put a small spoon of meat in on each circle, fold it over and pinch the edges to close the dumpling. Then take the two corners and fold them together to get the classic Pelmeni look. Boil each dumpling for about 5-10 minutes. Serve with pasta sause or simply melted butter. 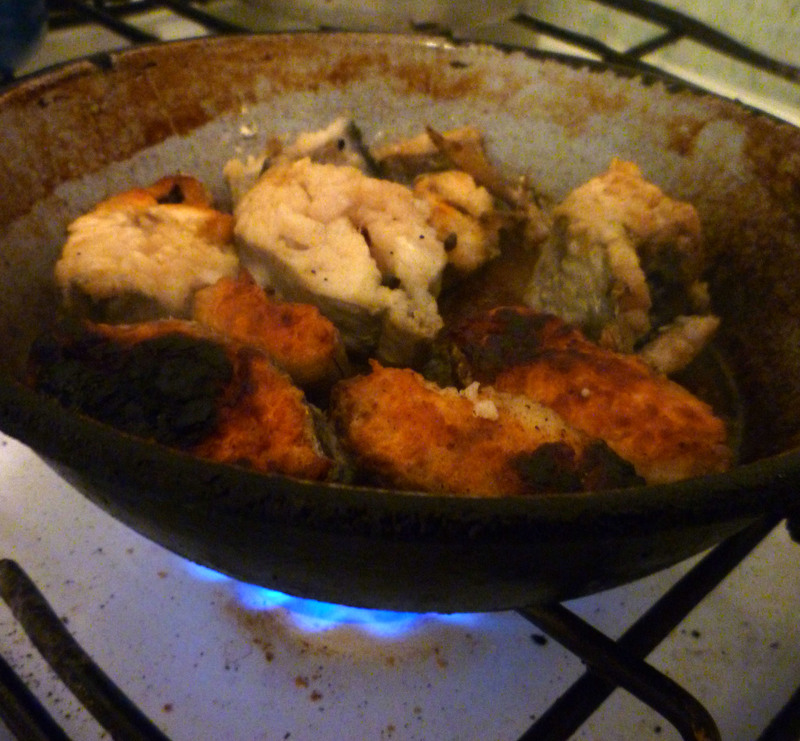 I have also become an expert at frying fish. I was never much of a fish person in the states, but meat is so expensive here, so I have found fish to be a great protein supplement. I simply buy a fish at the bazaar/market, gut it (something my host mother so diligently taught me), peel off its scales, cut it in slices, roll each slice in flour, then fry away! It is so tasty, but I also set my first alarm off EVERY time I do this. Tomorrow I am attending my first Orthodox Church service. When I was asked to accompany my co-worker, it seemed like more of a challenge then an opportunity. The service is three hours long, we have to stand the entire time and all women have to wear a head scarf (and no lipstick). It should be very interesting and I am grateful that my co-worker is willing to take me even though she knows I am not Catholic, much less a part of the Ukrainian Orthodox Church.